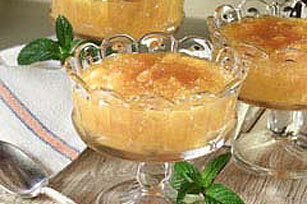 Quick-cooking tapioca turns canned peaches and sugar into a sweet, soft flummery pudding, an old-fashioned British dessert. Reserve several peach slices for garnish, if desired. Mash peaches in saucepan. Stir in sugar, tapioca and water. Let stand 5 minutes. Cook on medium heat, stirring constantly, until mixture comes to full boil. Pour into serving bowl or individual dessert dishes. Place plastic wrap on surface of dessert. Refrigerate 2 hours or until ready to serve. Garnish with reserved peach slices and fresh mint leaves, if desired. Substitute 1 can (16 oz.) pear halves, undrained, for peaches, omitting water.